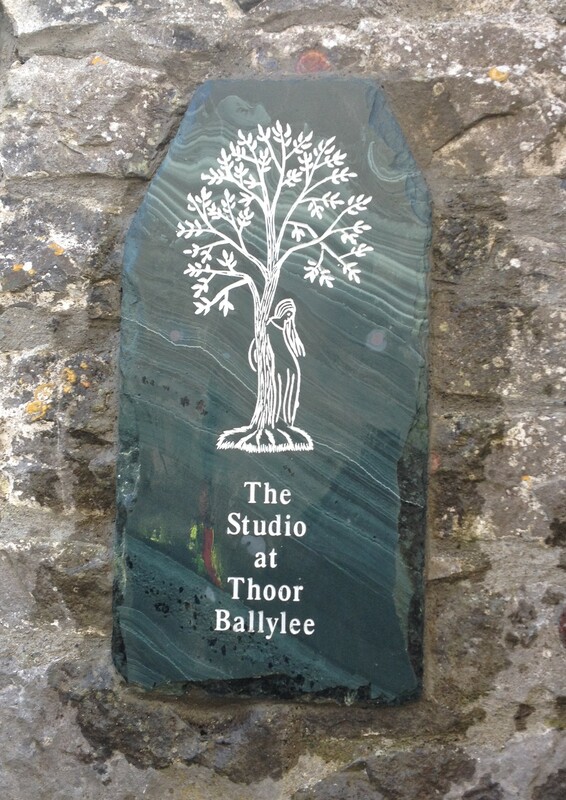 You are warmly invited to the opening of The Studio at Thoor Ballylee. Studio opened by Sister Mary deLourdes Fahy, local historian. Special Guest Mrs Sabina Higgins. 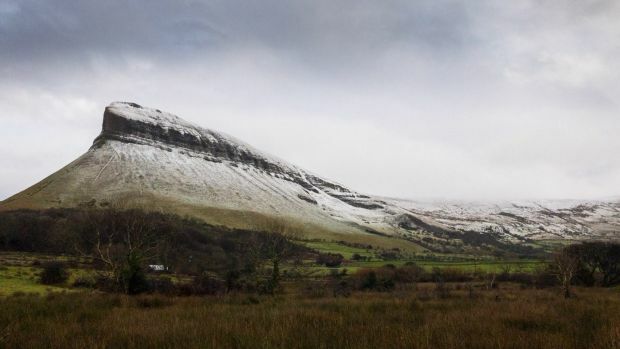 Featuring Kathy Mooney, weaver; Áine Ní Shioradáin, harpist, Mary O’Malley, poet. With an exhibition of artwork and craft by Lily and Elizabeth Yeats, with work by Jack B. Yeats, John Butler Yeats, and W.B. Yeats. 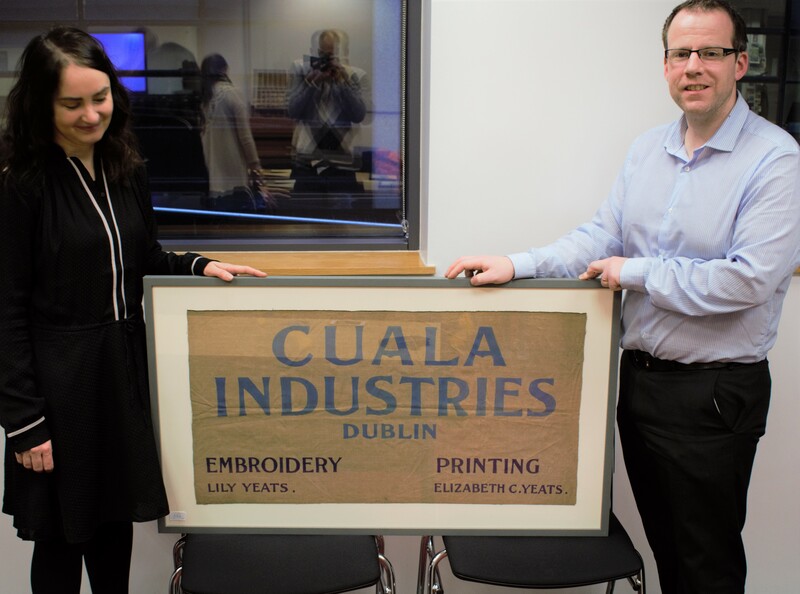 The new studio, intended as a meeting and workplace for today’s artists and craftworkers, honours Lily and Elizabeth Yeats, their creation of the Dun Emer Guild and Cuala Industries. We gratefully acknowledge the support of the Department of Heritage, Culture, and the Gaeltacht and the generosity of our private donors. Please join us as a new studio space opens at the Galway home of the poet W.B. Yeats! Designed for workshops, exhibitions, craft sessions, youth groups, special events, talks, and discussion forums, it combines work space for artists with educational and workshop facilities. The Studio at Thoor Ballylee forms a cultural hub in the west of Ireland that matches the commitment of Lily and Elizabeth Yeats to art and education. 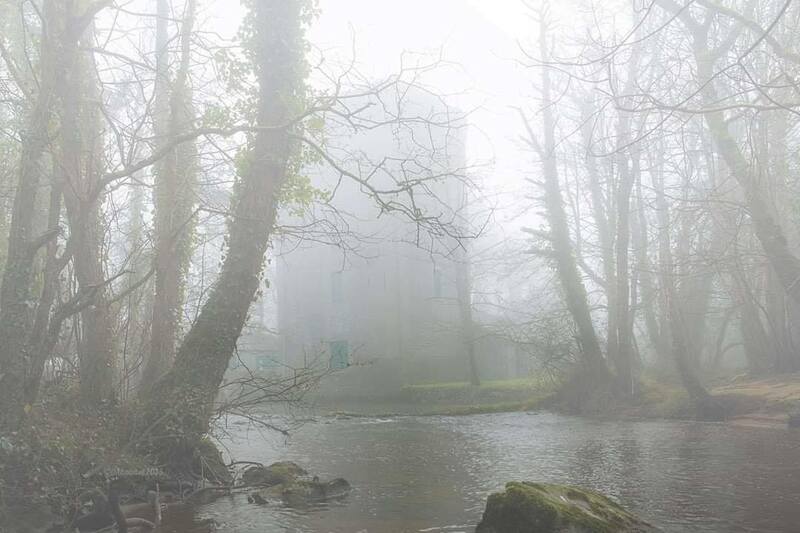 Thoor Ballylee is now open for the 2019 season 10am-2pm weekdays, 11am-5pm weekends. 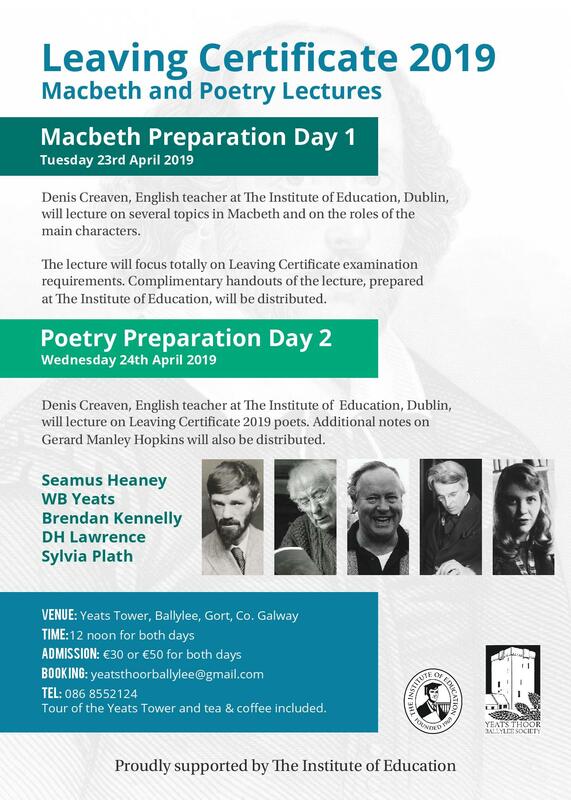 See our events page for more, including Leaving Cert lectures Tuesday 23rd and Wednesday 24th April. 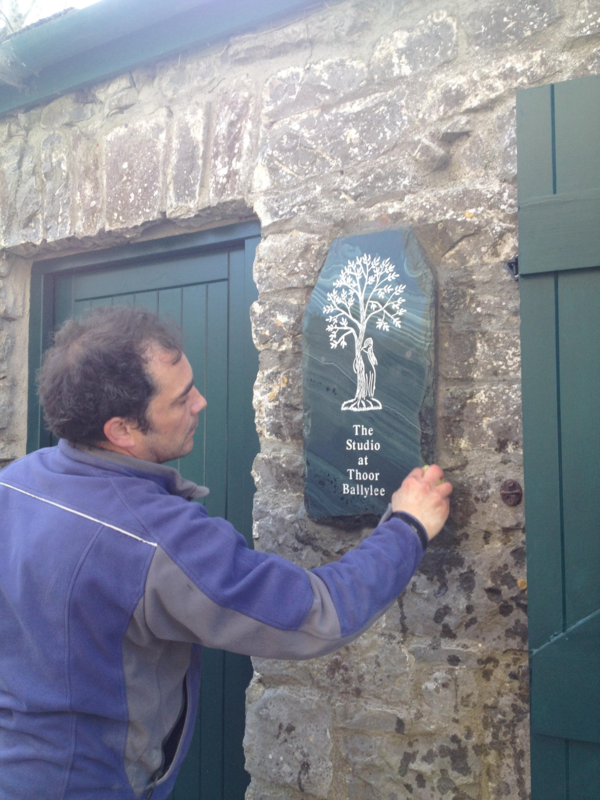 Stonemason Jetro Sheen of Sheen Stone Works, Gort putting finishing touches to the new slate sign for the Studio. 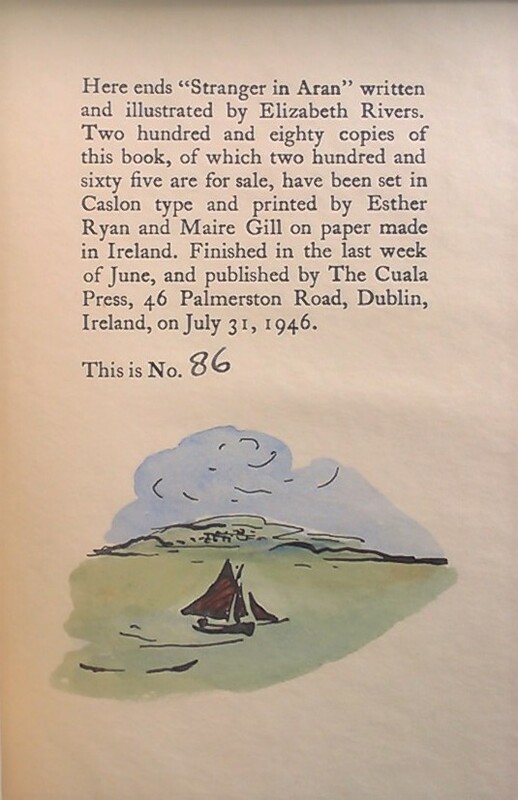 Design probably by Elizabeth Yeats, adapted from the Cuala Press. The studio is inspired by two extraordinary examples: the work and legacy of the Yeats sisters. As a designer and embroiderer Lily Yeats (born Susan Mary Yeats) studied with May Morris, before setting up as an independent artist and maker of textiles with apprentices of her own. 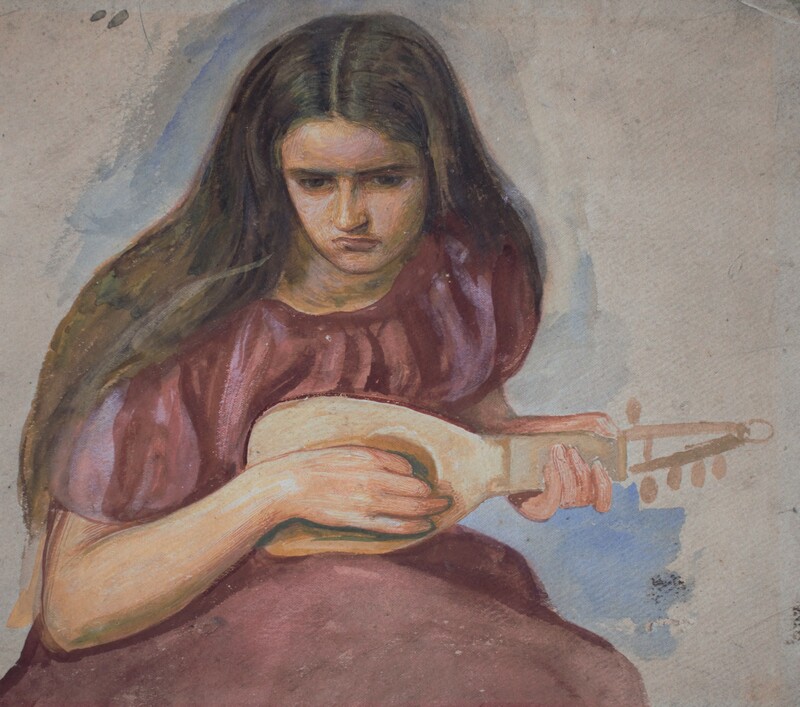 Her sister, artist and educator Elizabeth Yeats (known to the family as Lolly), pioneered the arts in the classroom, creating new watercolour brushwork techniques as a teaching method for children, and coaching young artists from Louis Le Brocquy to Anne Yeats. She became a hand-press printer and maker of books, publishing fine editions of art and literary works including by her brothers the poet W.B. Yeats and the artist Jack B. Yeats. Together the Yeats sisters were the founders of the Dun Emer workshop and then Cuala Industries, a groundbreaking nationalist and feminist collective producing art and providing skills, training, and apprenticeships across a range of applied artistic fields. Determined to revive, improve, and expand the reach of all the arts in Ireland, the example of the Yeats sisters stands behind the vision of the studio, with its emphasis on making of all kinds. 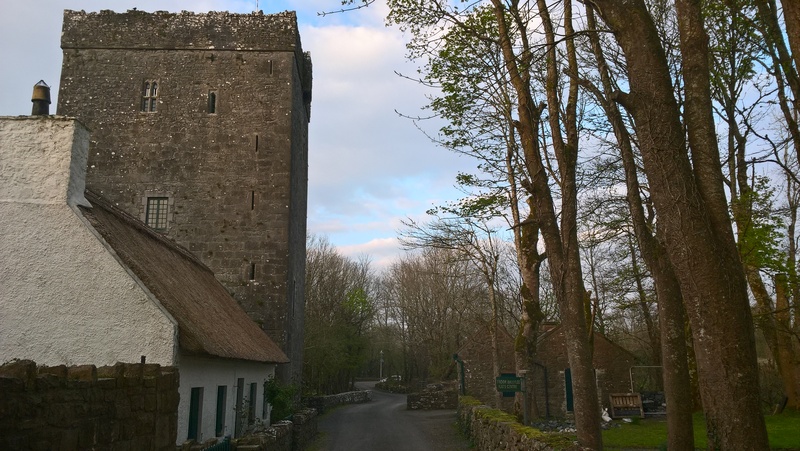 Originally an outbuilding converted to a garage by the Yeats family, the studio faces the Hiberno-Norman tower of Thoor Ballylee made famous by the poetry of W.B. Yeats, who lived and worked there with his wife George Yeats, also an artist and researcher of great ability, and their young family. Its transformation into a studio was made possible by generous private sponsorship and matching competitive funding from the Government of Ireland’s Department of Culture, Heritage, and the Gaeltacht. To find out more – or see how you can help – see our website donate page or contact yeatsthoorballyleesociety@gmail. 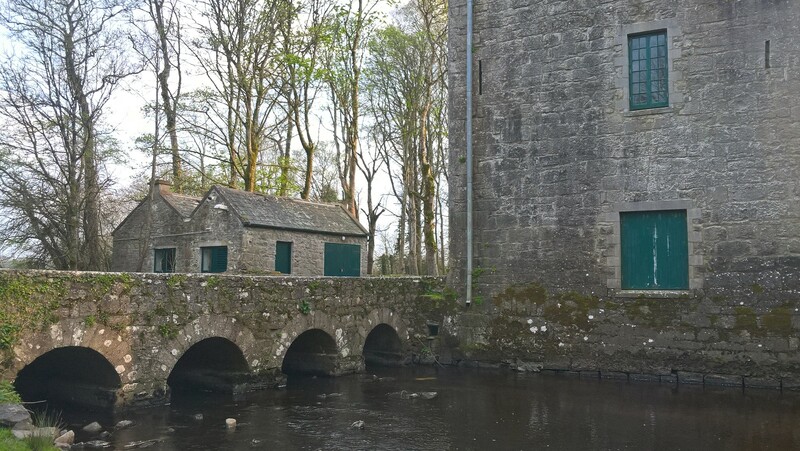 Today thanks to the sterling work of our volunteers and helpers, Thoor Ballylee is now open for the 2019 season 10am-2pm weekdays, 11am-5pm weekends. There are an exciting line up of events planned throughout the year. We kick off in grand style with the launch of our new studio space. 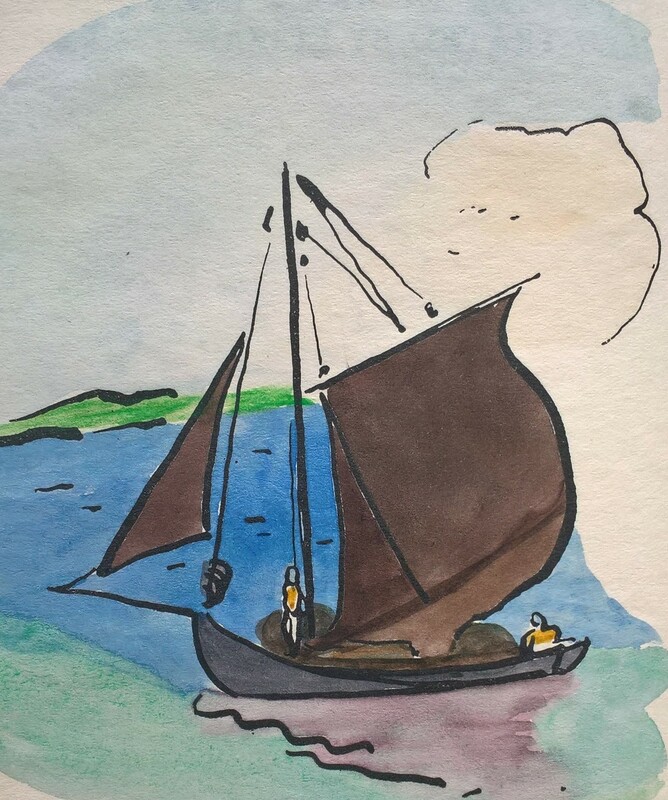 On Sunday 28th April 2019 at 3pm a new studio space opens at the Galway home of the poet W.B. Yeats. Designed for workshops, exhibitions, craft sessions, youth groups, special events, talks, and discussion forums, it combines work space for artists with educational and workshop facilities. The Studio at Thoor Ballylee forms a cultural hub in the west of Ireland that matches the commitment of Lily and Elizabeth Yeats to art and education. With a variety of configurations and uses the studio is designed to host artists, workshops, and young people. A series of craft workshops is planned throughout the year featuring textiles, printmaking, spinning, poetry, drama, storytelling, and more. The 2019 opening by local historian Sister Mary De Lourdes Fahy at 3pm Sunday 28th April features as special guest Mrs Sabina Higgins, with poet Mary O’Malley, weaver Kathy Mooney and harpist Áine Ní Shioradáin, plus other important artists and visitors. The studio hosts a special exhibition featuring work by Lily, Elizabeth, Jack and W.B. 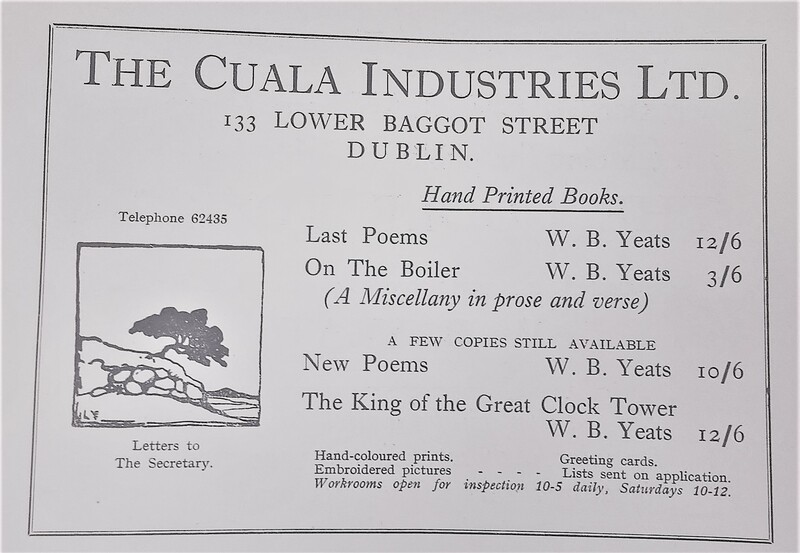 Yeats and the Cuala Industries workshop. Thoor Ballylee opens to all visitors from Saturday 20th April 2019. 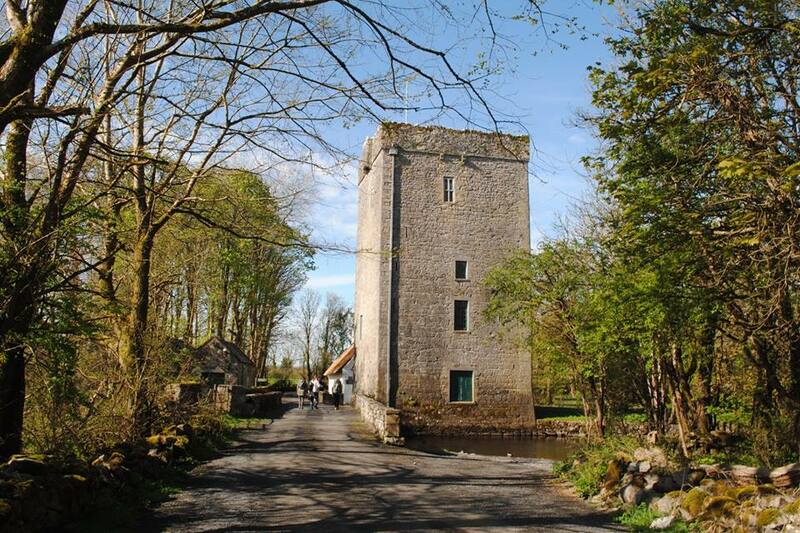 Yeats’s famous tower is open all summer for visits, cultural events, crafts workshops, and more! 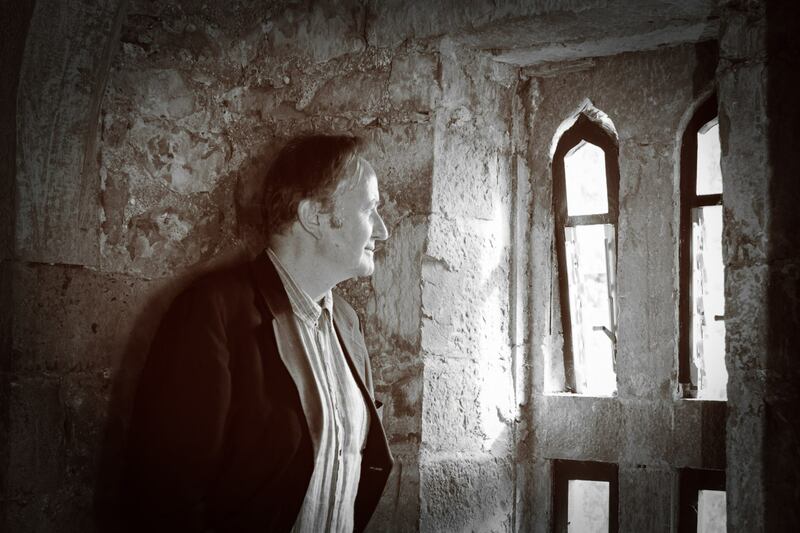 Come and visit the fourteenth-century Hiberno-Norman tower featured in so many of W.B. Yeats’s best poems. 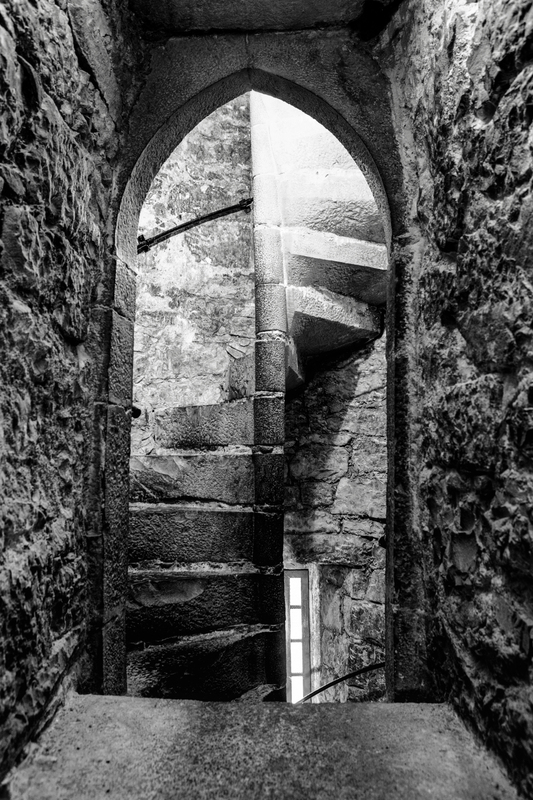 Climb the winding stair (and mind our precious bats and nesting jackdaws!). 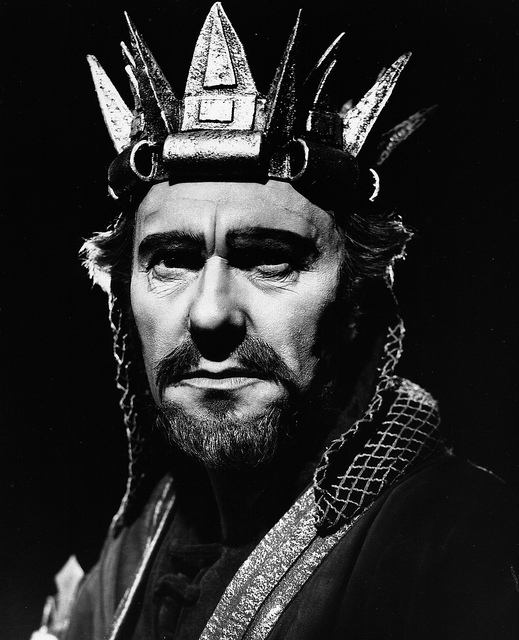 Discover more about the life and work of W.B. 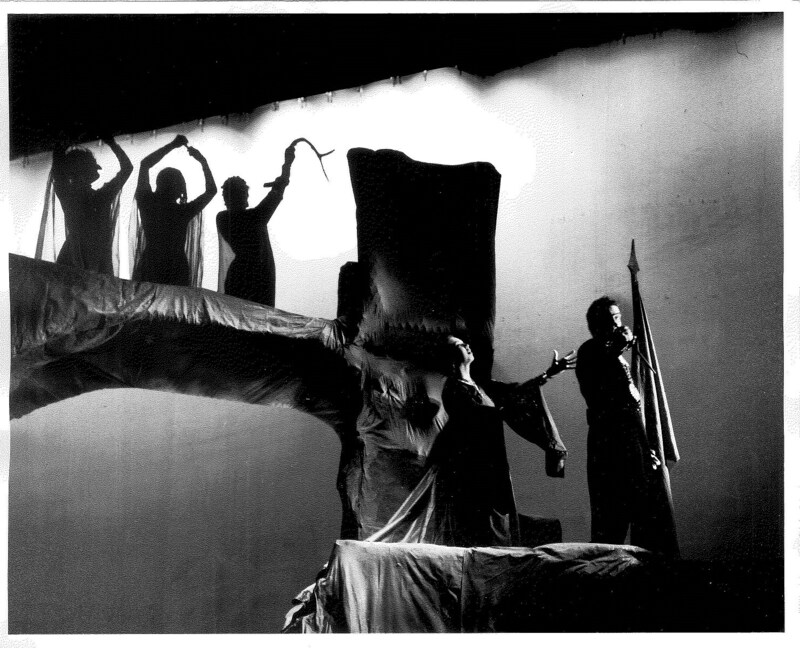 Yeats in world-class exhibitions. 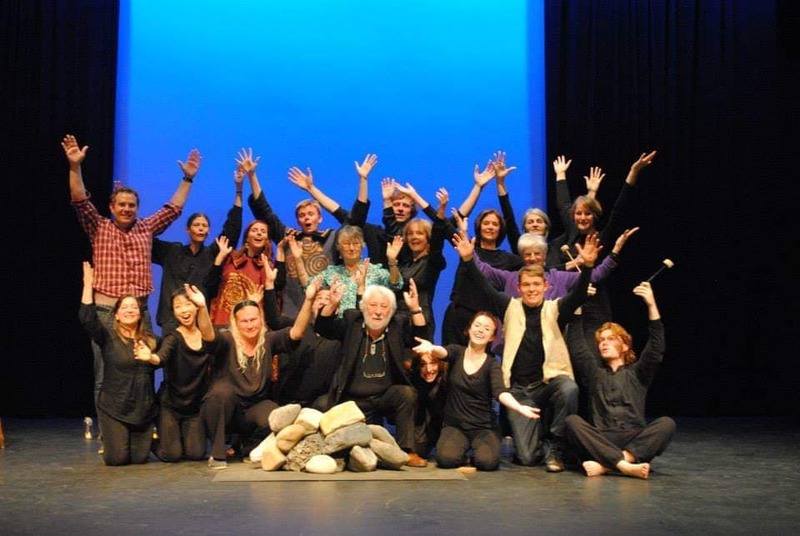 Join in our numerous cultural events, performances, and workshops! Treat yourself to tea and cake by our roaring fire, and browse in our giftshop. 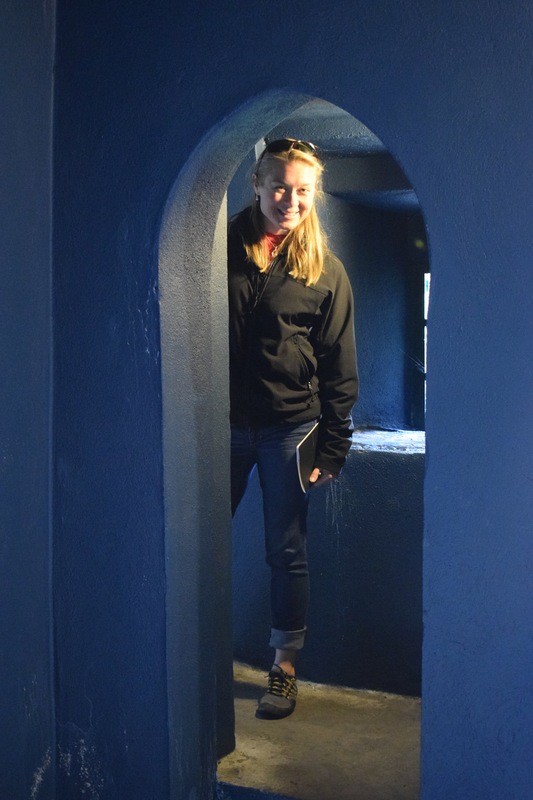 Or just soak in the atmosphere of the Norman tower and beautiful surrounds. Our first special event of 2019 is the launch of our new studio space, The Studio @ Thoor Ballylee. Open as a working space for artists and audiences, and featuring workshops, educational events, exhibitions, symposiums, and discussion groups, it forms a vibrant cultural hub in the west of Ireland that matches the commitment of the Yeats sisters to art and education. Funded by generous donors and the Department of Culture, the studio opens in honour of Lily & Elizabeth Yeats, artists and pioneer embroiders, printers, and educators. 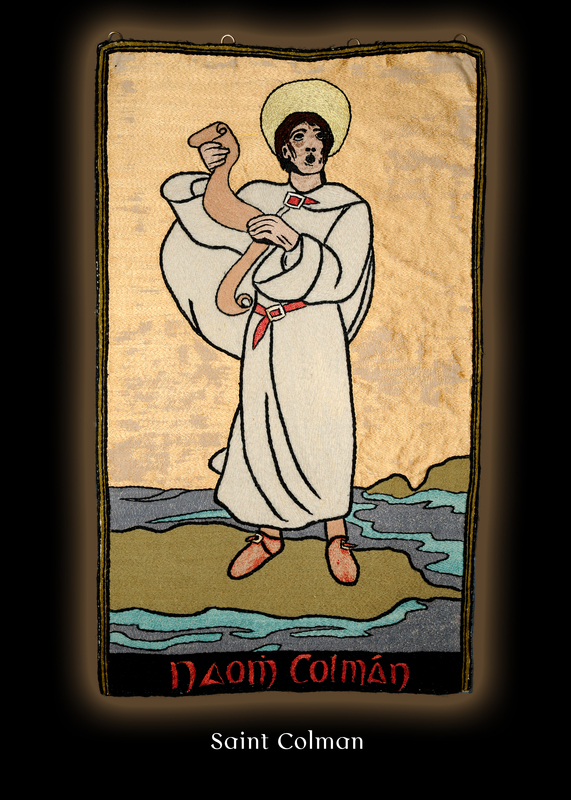 Our grand opening at 3pm Sunday 28th April features local artists and speakers and a wonderful exhibition of the Yeats sisters’ Cuala Industries material. 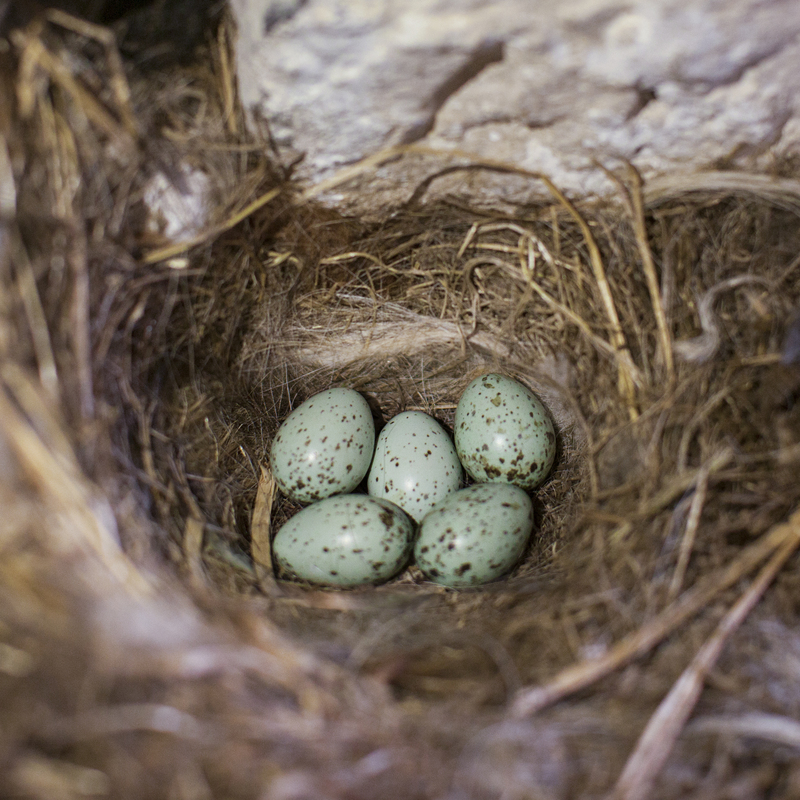 For more details see our visitors page. Our latest 2019 calendar of events is available here. 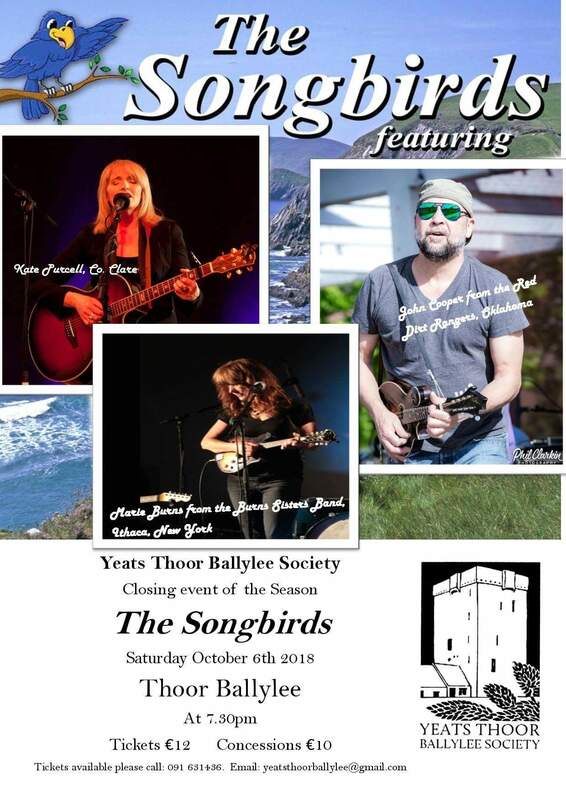 As a non-profit community organization, Thoor Ballylee is run by volunteers. To find out how you can help us in our mission to keep open Yeats’s tower for new generations click here. 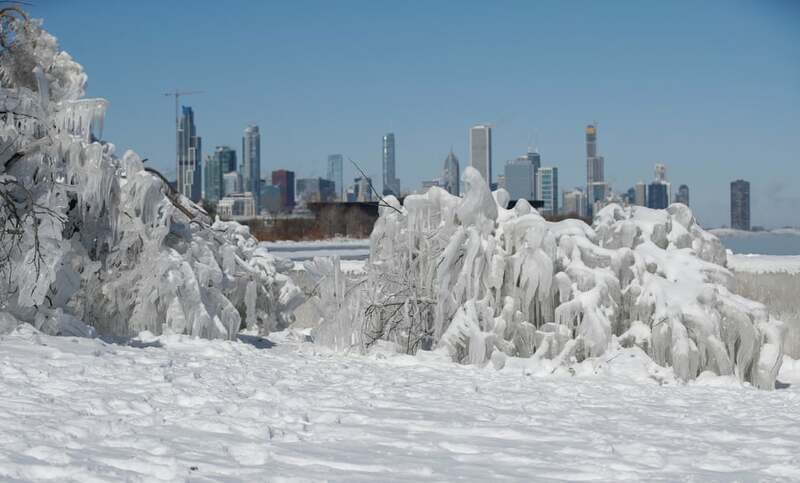 Season’s Greetings and a Happy New Year for 2019! 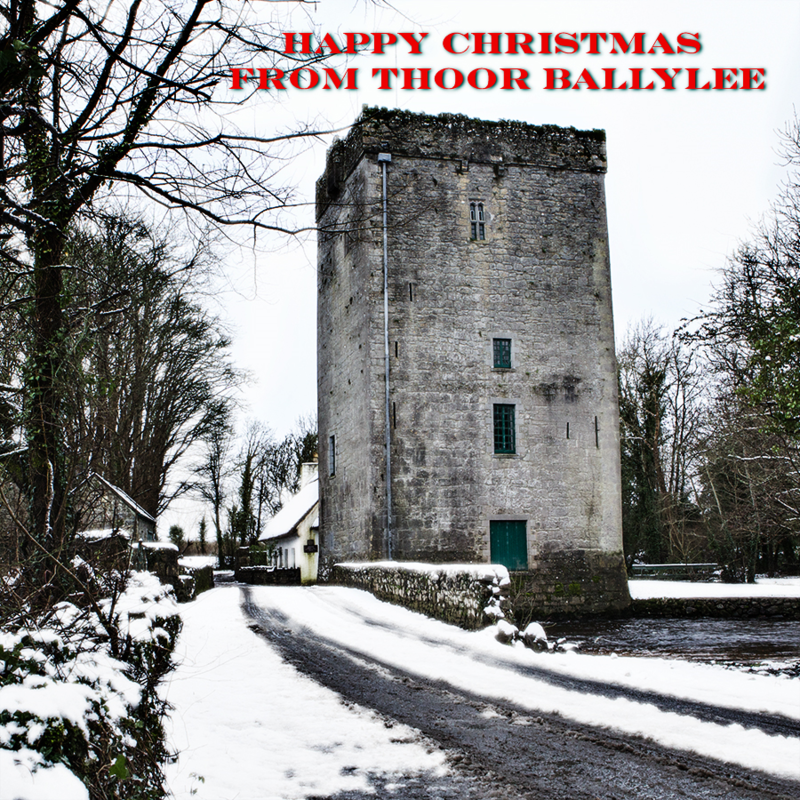 With our Season’s Greetings, Yeats Thoor Ballylee Society has great pleasure in sending you news of everything you have helped to support during the past year at Yeats’s tower in County Galway. We hope you are as pleased as we are with all the varied cultural events associated with the tower, and welcome your continued support for an equally ambitious programme of performances, tours, talks, and exhibitions in 2019. These are exciting times at Thoor Ballylee: work is in progress converting the old garage over the road into a magnificent new artist’s studio and residence. 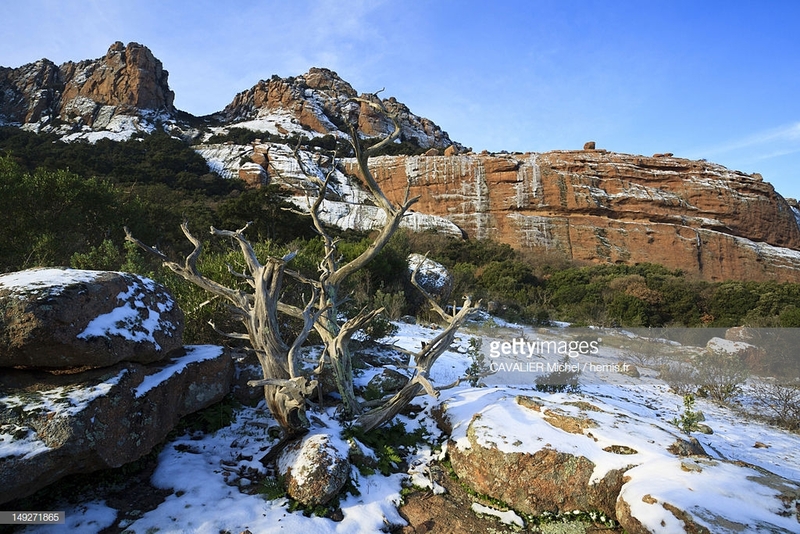 Many thanks and all the best for the Festive Season. The curtain has come down on another successful season at Thoor Ballylee. 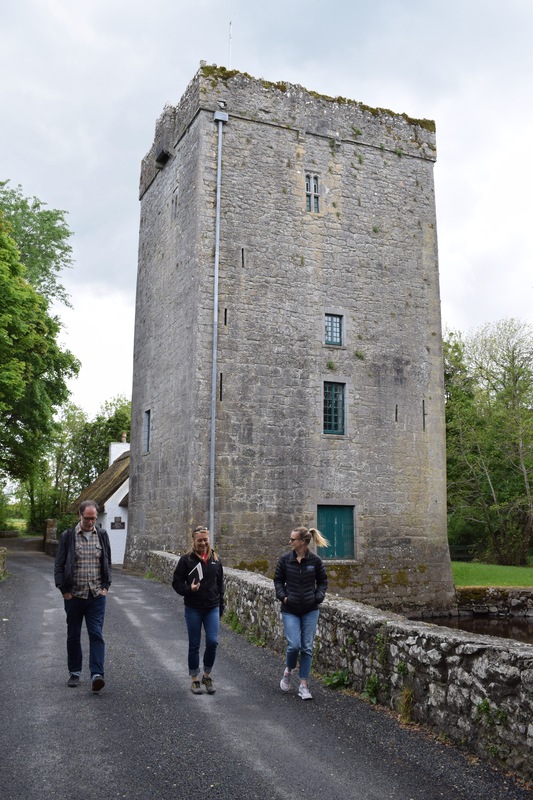 Around 4,400 appreciative visitors came to Thoor Ballylee during from April to October 2018. Many also came to our programme of special events. The Songbirds with their wonderful harmony and lyrics proved to be a popular public closing event, performing to a full house. This year the season was extended to facilitate the Architecture at the Edge festival 2018. Many first-time visitors from the locality and afar, took advantage of our open house day to visit the home of W.B. 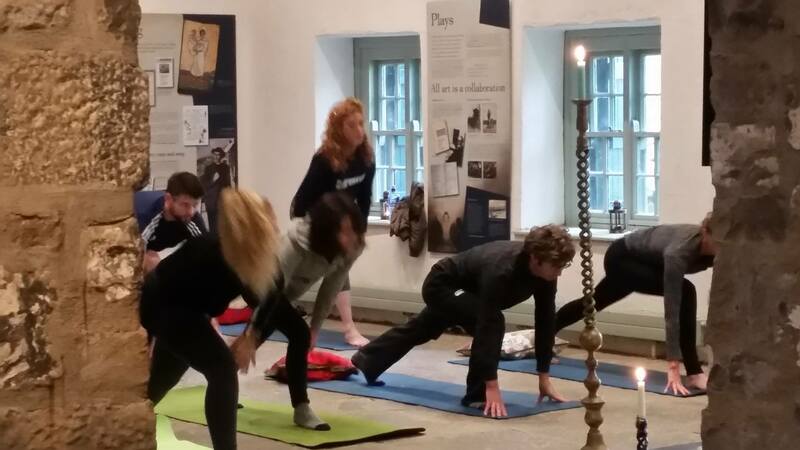 Yeats, and even began with an hour of Architectural Yoga conducted by Sarah from the Gallery Café. With his eastern and esoteric interests W.B.Y. might well have approved. 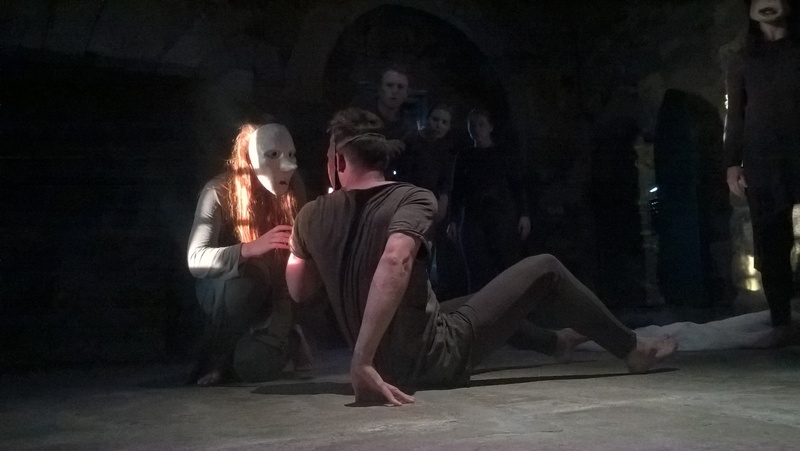 Other successful events held during the year include two Talks for Leaving Certificate students courtesy of Denis Creavan, and a riveting production of The Only Jealousy of Emer by Galway based DancePlayers, including members of NUI Galway’s Drama department. As a special treat for W.B.Y’s birthday we enjoyed a Sunday afternoon of medieval music in the medieval tower, with the talented & delightful Coole Music troupe, dressed in medieval costume. We even had a birthday cake. A second celebration of the birthday featured wine and amazing food, provided by the very talented Anna and featured poetry reading by the mill. 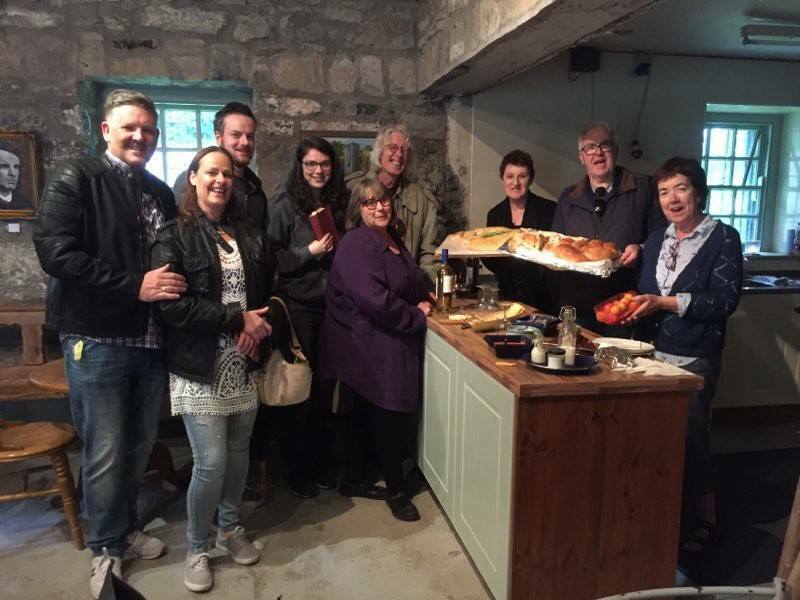 Thanks again to Anna O Donnell and to Brendan Murphy, for their demonstration of Lady Gregory’s brack cake and stories from the Abbey. This was our nod to Heritage Week. 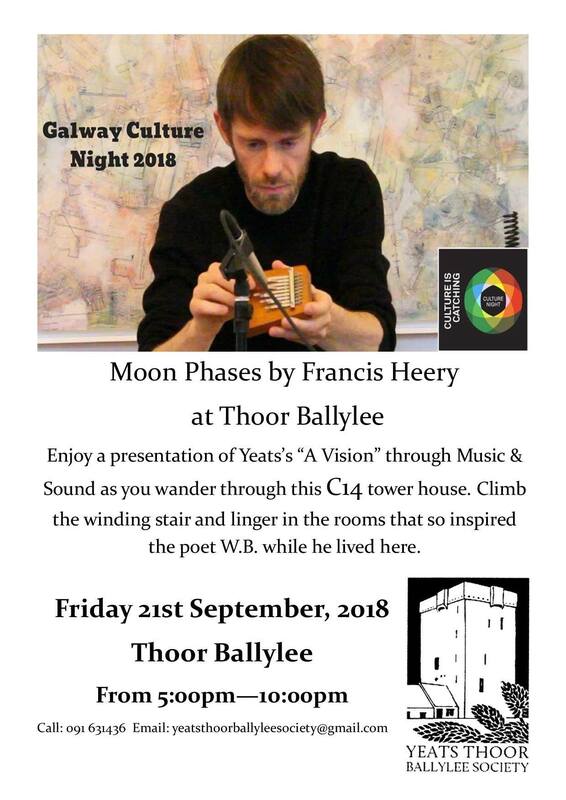 For Culture Night, the composer and sound artist Francis Heery brought poetry to Thoor Ballylee and an immersive sound installation in his presentation of A Vision. Supported by the Arts Council, this, one of the main events in County Galway, was unquestionably a memorable night, quite out of the ordinary for lots of reasons. 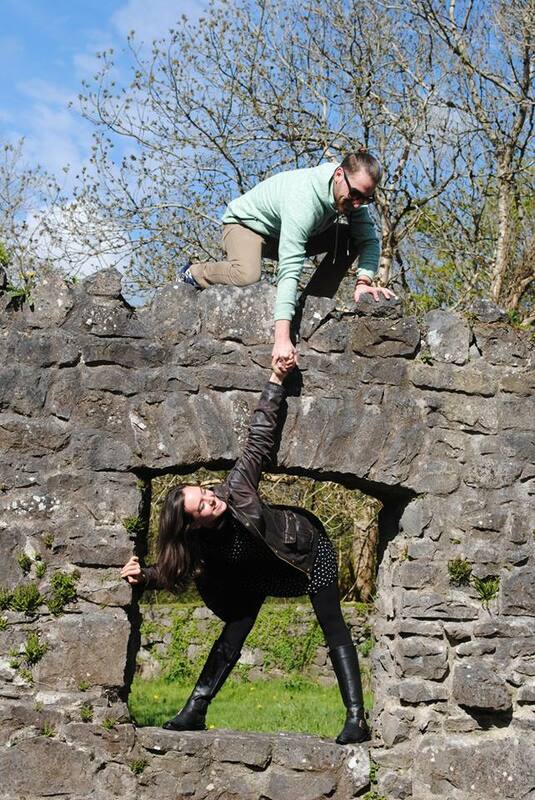 Francis even proposed to his fiancée on the battlements just before the show & she said ‘yes’. It all happens at Thoor Ballylee! Indeed two local wedding parties chose Thoor Ballylee and its beautiful, tranquil, surrounds for their wedding photographs. 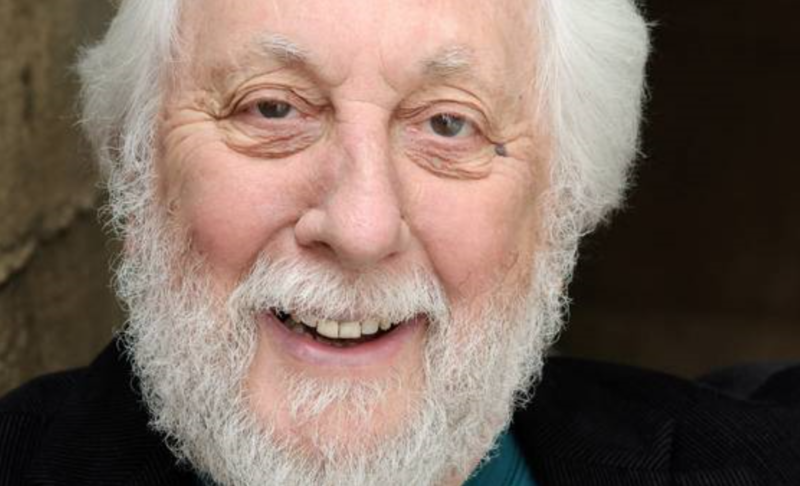 We were joined also by the Professor Roy Foster, distinguished historian and biographer of W.B. Yeats, prior to his lecture on Thoor Ballylee for the Galway International Arts Festival first thought talks. The Galway Film Fleadh came on tour in a special event to Thoor Ballylee. 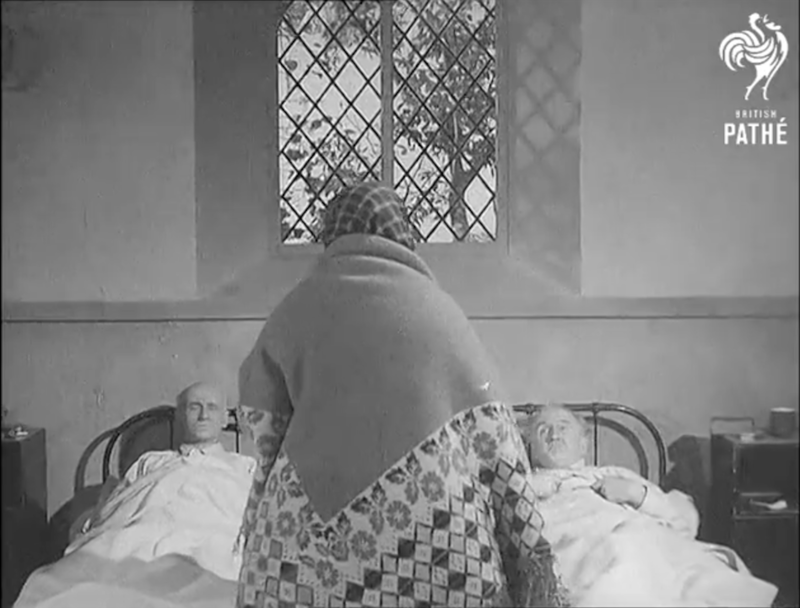 Three films from the archives of the Irish Film Institute about Yeats and Lady Gregory, Coole Park and one of Gregory’s plays from the Abbey Theatre were screened in our spectacular audiovisual room in July. Lovers of the art of spinning and weaving enjoyed an afternoon trying their hands at the spinning wheel, thanks to the Irish Spinners and Weavers Guild from Clare and Galway. Our appreciation goes also to Coole Music Junior Quartet who entertained spinners and visitors alike. Kate and Ruth our local intrepid Headford Bat Rangers put together an interpretive piece on Thoor Ballylee and the Lesser Horseshoe bats which nest in the tower. 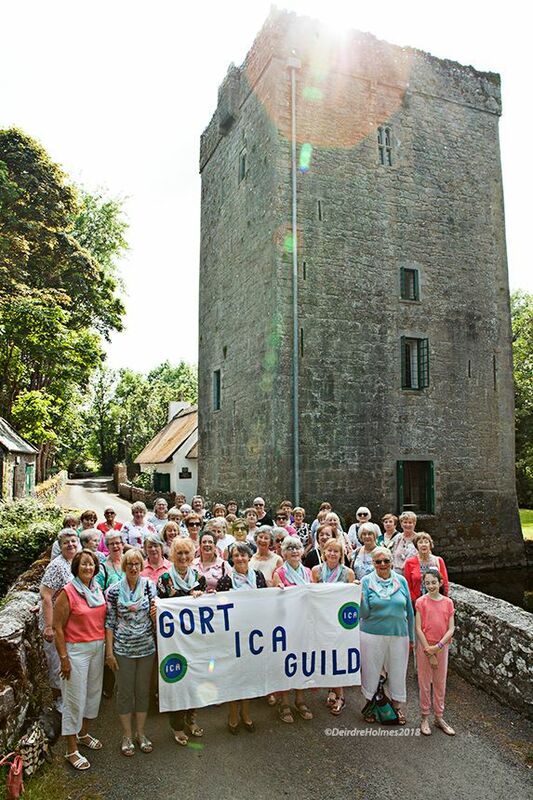 We had any number of visitor groups throughout the summer from locals like Gort ICA to the Yeats International Summer School, and many individual and family visitors from all around the world. The final day of the Yeats and Lady Gregory Autumn Gathering brought September to a close with a lecture and a film about the life and loves of Lady Gregory. That was also the day that W.B.Y.’s candlesticks, handsome brass altar pieces came home to Thoor Ballylee, proudly standing by the hearth after ninety years away. Our heartfelt thanks go to our wonderful benefactors. None of this would be possible without a great number of helpers, volunteers, artists, gardeners, skilled craftspeople, and a host of supporters from here and abroad. Our esteem and appreciation goes to our dedicated staff, led by the wonderful Rena McAllen: Nichola, Frank, Gary, and Krzysztof. And to our knowledgeable, enthusiastic, and most generous volunteers: Phil, Pat O L., Rose, Tonii, Karen, Pat F., Rosemary, Anna C. Dominic. 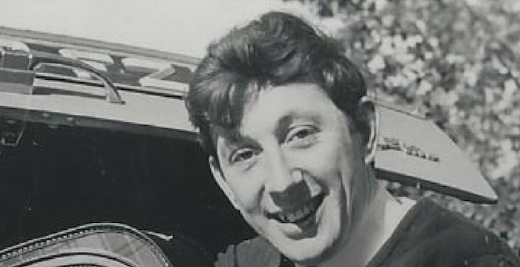 A special thank you also to intern Gerry who generously offered to cover every Saturday up until now. Thanks to JJ for manning the car park and lighting our way in the dark during events. This is the fantastic team that has kept the home of W. B. Yeats open to the public for all six months of the summer, for seven days a week during the height of the season and for eight hours (and more) a day. Our visitor book records the appreciation, delight, and gratitude of the thousands of people who came and experienced the atmosphere and spirit of Thoor Ballylee. They enjoyed discussing the Yeats family over a cup of tea with staff, viewed our exhibitions and AV presentation, climbed the winding stair, lingered in the many original rooms, admired the spectacular 360 degree view, read poetry, sang, played music, or took selfies on the battlements (and not one fell off). 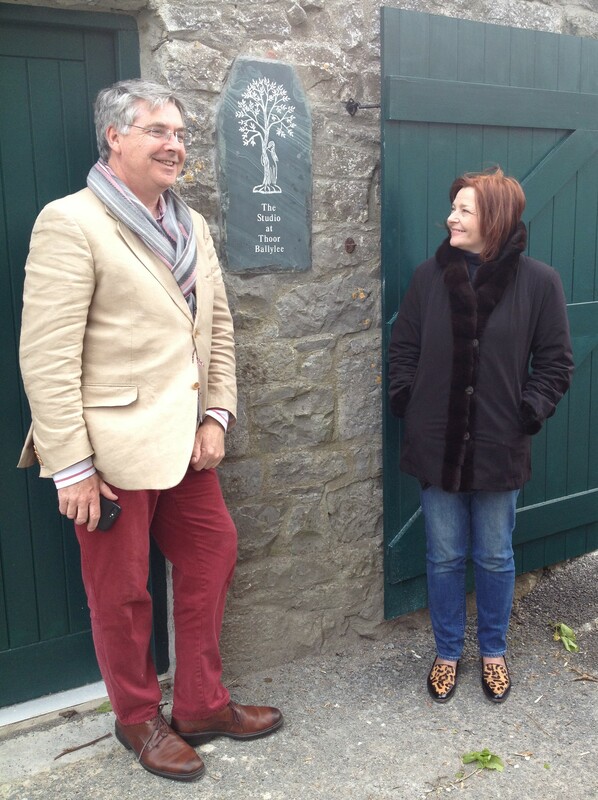 Thanks in particular to Failte Ireland for continued help with maintenance and repairs. 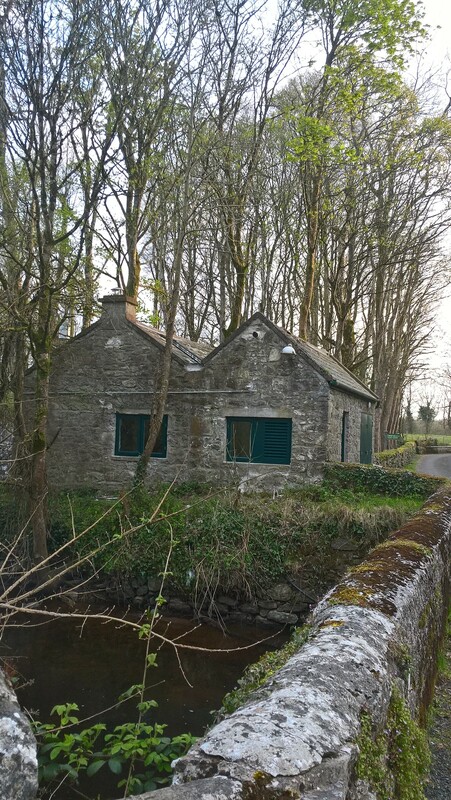 Work has already begun on the conversion of the garage into a studio for artists in residence so we look forward to exciting times at Thoor Ballylee. Most of all our thanks and appreciation to our wonderful friends and benefactors, whose generosity and financial support enables us to keep the spirit of Yeats and his extraordinarily talented family alive. Culture Night sees a wealth of culture showcased all over Ireland with performances, plays, exhibitions, talks, and events taking place all through the country. 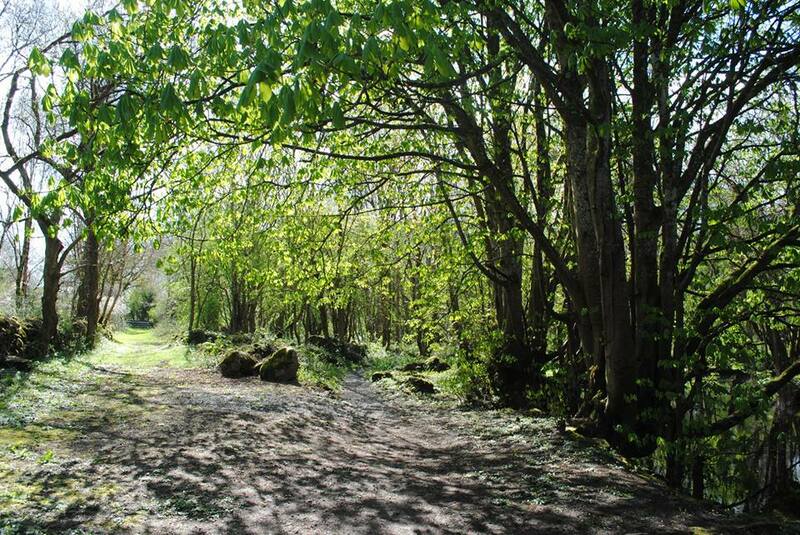 Thoor Ballylee in County Galway is no exception. 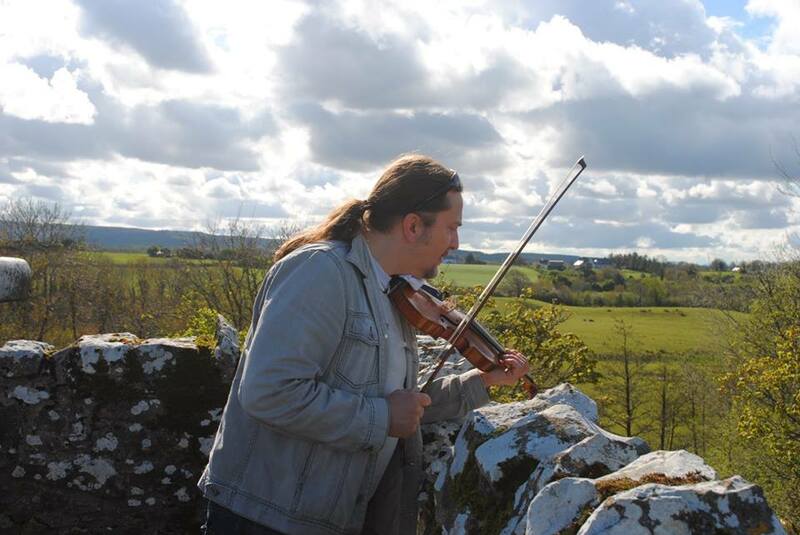 This Friday 21st September from 5pm sees a site-specific musical performance and installation from award-winning composer and sound-artist Francis Heery. 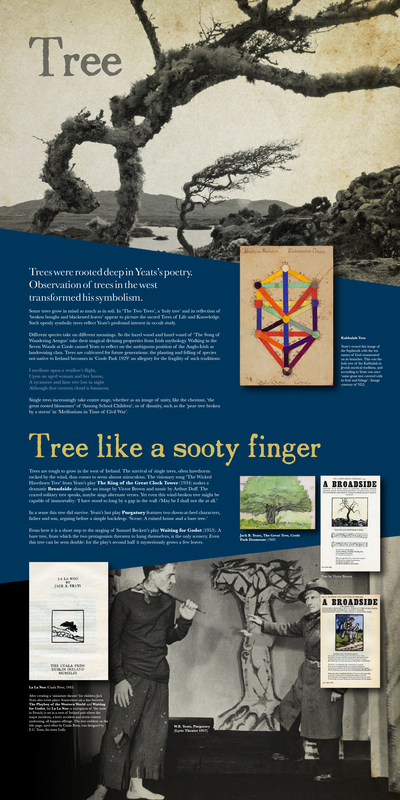 As featured in the Irish Times, ‘Moon Phases’ presents a unique interpretation of WB Yeats’s strange and wonderful A Vision, a book of philosophy, psychology, and history inspired by his wife George and their experiments in dreams and automatic writing. 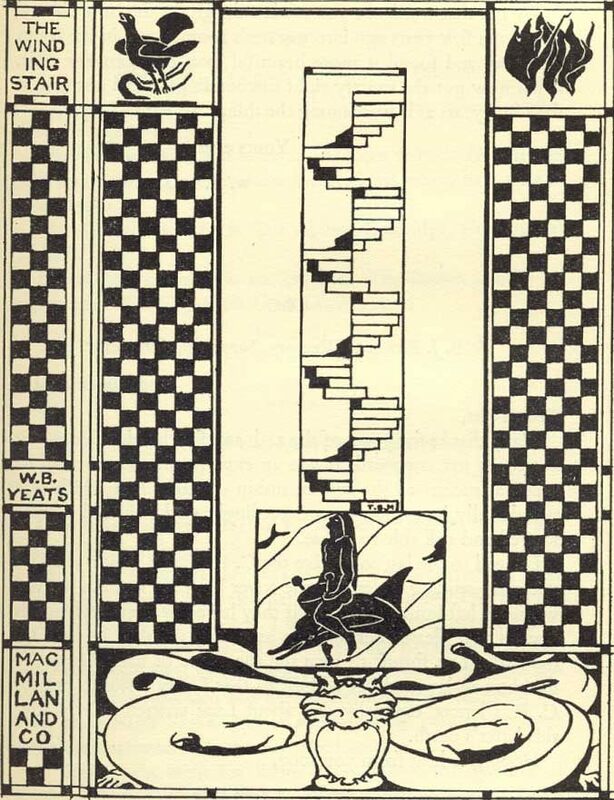 As William Blake wrote in his Jerusalem “I must create a system or be enslaved by another man’s”, and it was here that WB and George Yeats achieved this. In the rounds of the moon they found both a way of describing different personalities and the cyclical movements of history. 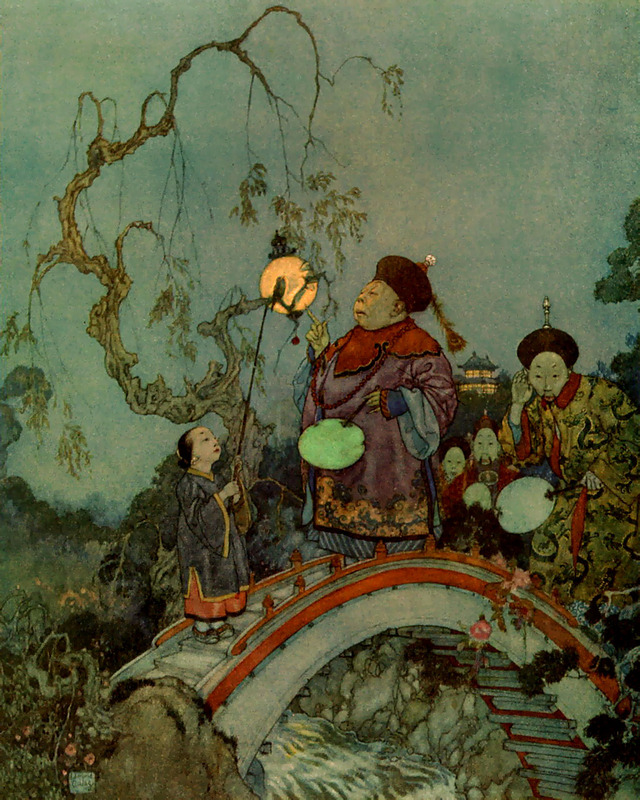 Poems like ‘The Phases of the Moon’, ‘The Second Coming’ and ‘All Soul’s Night’ are testament to the enduring importance of the book, and its deep attention to both recurrences in both vision and sound. Join us for a unique and fascinating evening – a sonic experience like no other. 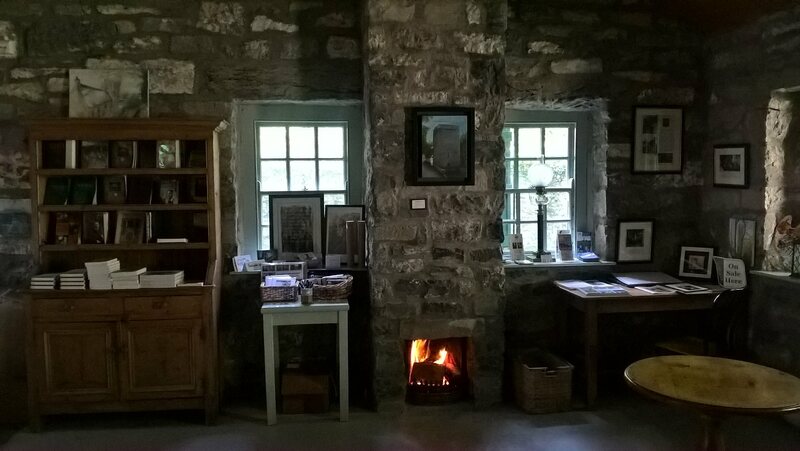 Drop in, listen, wander, for as little or as long as you like – take tea and refreshments, browse our shop, and climb the winding stair as darkness falls.